Cigarettes aux amandes are a wafer-thin, crisp, sweet biscuit often served as an accompaniment to ice cream or hot chocolate. They’re sometimes called tuiles (or tiles) because they look like authentic roof tiles found along the French countryside. To me, they look a lot like Pringles! However, this recipe calls for them to be formed into cigarettes, so I’ll try that too. The recipe for tuiles reminded me of Krumkake (which means crumble cake or cookie, pronounced KROOM-kah-kah), a Norwegian favorite at Christmas time in our family. It’s a flat cookie that’s rolled around a cone-shaped pin or dowel, similar to a waffle cone or a pizzelle (the Italian waffle cookie). It, too, has an almond flavoring. The batter is put into a Krumkake iron, which resembles a waffle iron. A traditional old world iron is placed over a hot burner on the stovetop, although now you can buy models that are electric. Typically, the iron stamps a pattern onto both sides of this thin golden-brown cookie, which has a crisp texture once it is cooled. Once cooked, you must quickly roll it using a cone roller before it becomes too brittle to roll. Krumkake is often served with whipped cream inside, but ice cream is delicious too. A few years ago, my mom brought my grandmother’s heavy cast iron Krumkake iron on the plane for me to have. What an honor, and finally, I’ve used it. It’s been well-loved and has the patina of many Krumkake cookies layered on it. Although it’s not electric and doesn’t have a “color select dial” to let me choose from golden to brown, it worked just fine and I felt connected to times past and fond memories of eating this delicious cookie at Christmas. I also realized how easy it is to make and next time will not hesitate to pull it out of the back of the pantry. Here is a video of how the Krumkakes are cooked and rolled. These guys make it look easy! However, it's not everyone's favorite thing to make. I found this funny story about someone who had a tough time making Krumkake with her mom. For both Cigarettes aux amandes and Krumkake, shaping them can be the trickiest part of the recipe. You must do it while the cookies are still very warm, or they will dry and become brittle and impossible to bend. You can use a pencil, a dowel, a skewer, a special cone shaped dowel, a bowl, a teacup, or a rolling pin. 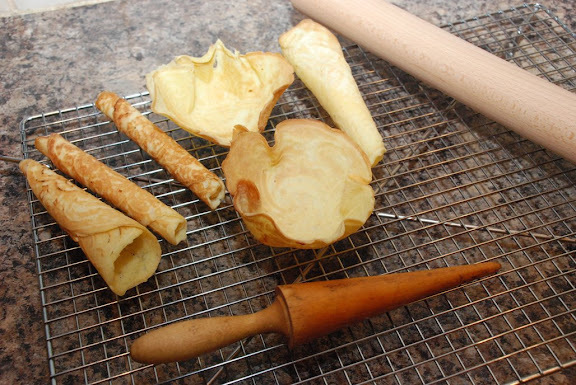 You can even buy a tuile sheet for shaping them into the traditional curved shape. If you're baking them in the oven, you can make your own template using acetate or stiff plastic (such as the top of a plastic container). You can also pipe patterns using a piping bag or paper cone. Use your imagination. Now that the crunchy bit of the dish is done, it’s time for the creamy ice cream. 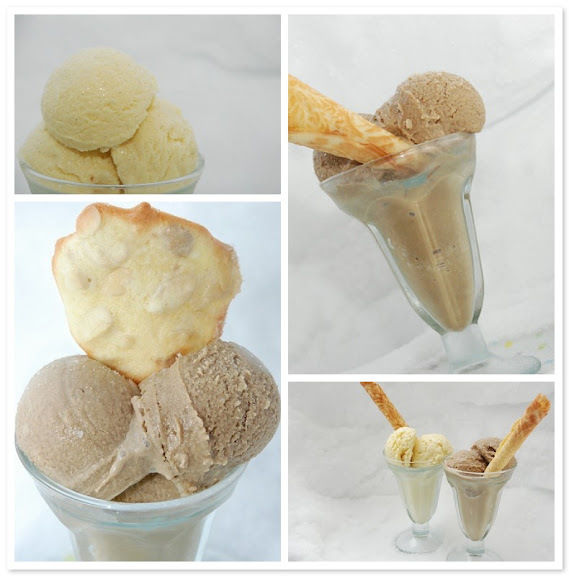 Ice cream is so simple to make. All you need is an ice cream maker. Thankfully, after all the years of Christmas gifts and appliances I’ve received, I seem to have all the ones I need. Here's a useful video on making Crème anglaise. Whisk the sugar, the egg, and the egg whites. Gently fold in the almonds and let rest for about 15 minutes o soften them. Gently stir in the flour and vanilla being careful not to break the almonds. Refrigerate the batter for 2-3 hours. Preheat the oven to 400°F. Use a Silpat or butter a baking sheet. Spoon a small tablespoon of batter on the baking sheet. Space them about 4 inches apart. Flatten each cookie with the back of a wet fork. Transfer the baking sheet to the oven and turn the oven down to 350°F. Bake until the cookies are golden, 5-15 minutes. Turn the baking sheet half-way through the cooking time. With the door of the oven open, lift one cookie off the baking sheet and drape over a rolling pin. Press gently to bend the cookies around the rolling pin. If they cool too much, they will be too brittle to shape. Repeat with the remaining cookies. These cookies should be served the same day they are made. That’s when they’re the most crispy. If you can’t serve them right away, store them in an airtight tin. Do not store with other cookies or they'll get soft. 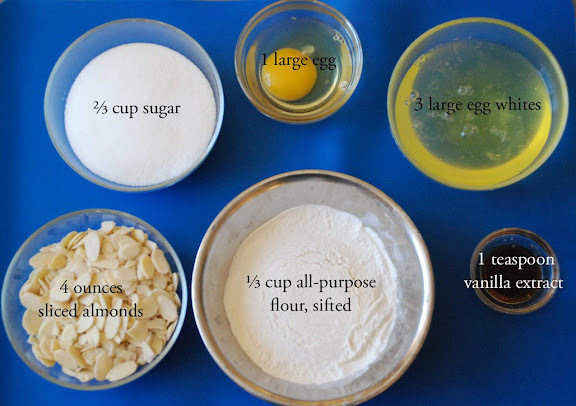 Flavor Variations: Traditionally, Cigarettes aux amandes are flavored with almonds. 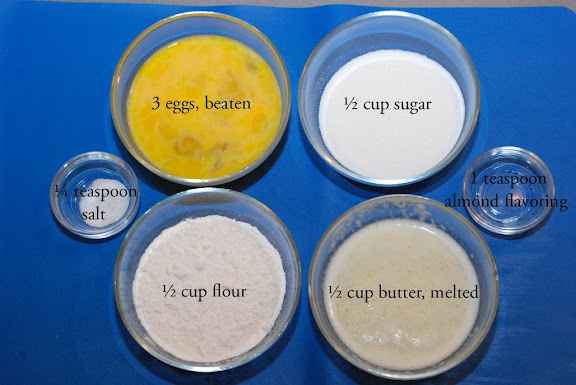 However, there are a variety of options for flavoring this batter, including chocolate, coconut, coffee powder, hazelnuts, herbs, jasmine, lavender, lemon, orange, passion fruit, pecans, pistachio, vanilla, or walnuts. Whisk the eggs and the sugar. Stir in the remaining ingredients. Do not over-beat. Heat the iron. Drop about 1-2 tablespoons of batter on the iron. Follow the manufacturer’s directions. Roll on pin immediately. Like Cigarettes aux amandes, these cookies should be served the same day they are made. That’s when they’re the most crispy. If you can’t serve them right away, store them in an airtight tin. Do not store with other cookies or they'll get soft. A friend of mine makes large batches of Krumkake at Christmas time for friends and family and delivers them in paper boxes tied with a ribbon. They keep well for weeks that way and they make a nice gift! Put the milk, heavy cream, vanilla extract, and vanilla bean into a heavy-bottomed saucepan (or over a water bath) and bring to a boil. Remove from heat. Remove the vanilla bean pod. Combine the egg yolks and sugar in a heatproof bowl and whisk until thick and pale yellow. The mixture should form a ribbon when the whisk is lifted from the bowl. Gradually whisk in half of the hot milk mixture. (This is called tempering since you don’t want to scramble the eggs. The key is to do this slowly to bring the egg mixture up to temperature without curdling them.) Then whisk in the remaining milk mixture and return the mixture to the saucepan. Cook over low heat, stirring constantly with a wooden spoon, until the custard coats the back of a spoon. Do not boil; it will curdle if boiled. (If it does curdle, either strain or blend in a blender, adding cream if necessary.) Remove the custard from the heat and strain it into a bowl. Transfer to an ice cream maker and follow the manufacturer’s directions. Then, transfer to a container and freeze until firm, about 1 hour. 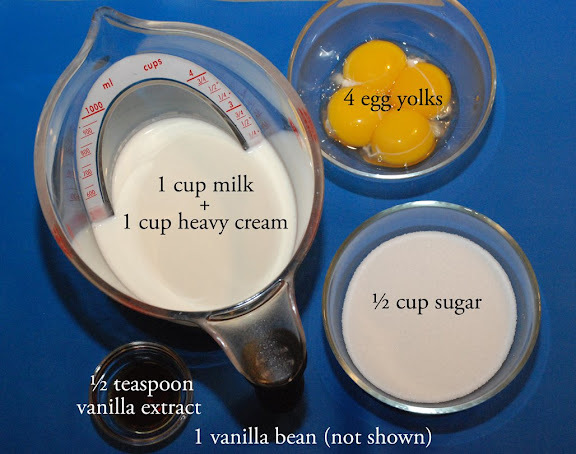 Put the milk, heavy cream, and vanilla into a heavy-bottomed saucepan (or over a water bath) and bring to a boil. 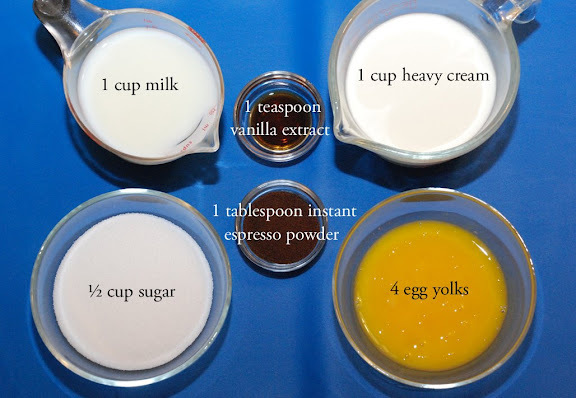 Add the instant espresso powder to dissolve. Remove from heat. Combine the egg yolks and sugar in a heatproof bowl and whisk until thick and pale yellow. The mixture should form a ribbon when the whisk is lifted from the bowl. Gradually whisk in half of the hot milk mixture. (This is called tempering since you don’t want to scramble the eggs. The key is to do this slowly to bring the egg mixture up to temperature without curdling them.) Then whisk in the remaining milk mixture and return the mixture to the saucepan. Cook over low heat, stirring constantly with a wooden spoon, until the custard coats the back of a spoon. Do not boil; it will curdle if boiled. (If it does curdle, either strain or blend in a blender, adding cream if necessary.) Remove the custard from the heat and strain it into a bowl. 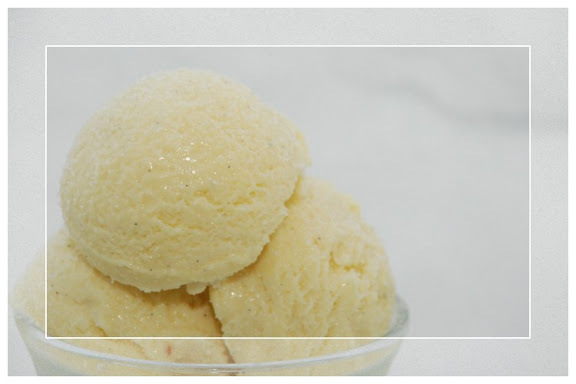 Transfer to an ice cream maker and follow the manufacturer’s directions. Then, transfer to a container and freeze until firm, about 1 hour. My kids were amazed that I was able to make vanilla ice cream, asking incredulously, “You made this? ?” And the coffee ice cream…let’s just say that I’ll never have to buy Coffee Häagen-Dazs® again! The problem was that the recipes only made 6 scoops of each kind! I’d definitely double these recipes next time! I made both the Cigarettes aux amandes and the Krumkake. I found the Krumkake lighter, more crunchy, and tastier with the ice cream, but I’m part Norwegian! I even added some sliced almonds to the Krumkake batter and tried baking them the way the recipe for Cigarettes aux amandes describes. These turned out good too. A delicious ice cream treat to enjoy any day of the year, even after the 13 feet of snow we’ve had to shovel this winter in Ottawa. how much snow have you had to shovel this year? Remember to check out my March give-away. See Whisk-ing you a GIVE-AWAY. *0 snow shovelled by me - (my sympathies to Ottawa folks). Loved the KrumKake story-- great photos. Interesting mix of textures.